Club Penguin Cheats by Mimo777 Club Penguin Cheats by Mimo777: Puffle Party and Rainbow Puffle Coming Soon! 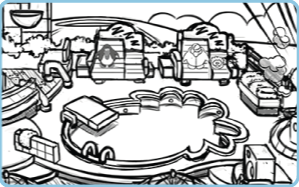 A little while ago Club Penguin posted a few picture clues of what's coming up on CP in March. Many guesses were saying the Puffle Party is returning this month, and also that there will be a brand new Rainbow Puffle coming soon! You who guessed that, you're right! More Puffle Party news coming soon! Stay tuned for that! Hmm. I actually don't like the idea. I mean, the rainbow puffle has always been a legend, and a legend should stay, like the golden puffle and stuff like that. I would have prefered another colours of puffles, like grey, aqua, maroon or lavender. CP DOES give to many sneak peeks. I mean, seriously, a RAINBOW puffle? Whatever the personality, that personality should have been for the hot pink puffle everyone thought would come! I mean, in the vids 'How to get a rainbow puffle' people might say 'thumbs up if it's 2013 and you've got one'. 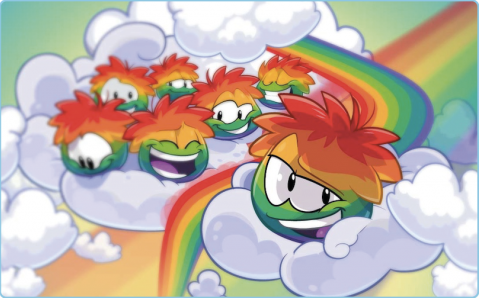 In my opinion , I think that these "Rainbow" puffles look a sort of weird color!The colors should have been perfectly blended or the puffle could have change the rainbow colors every one second like magic!It would have been epic! I also think it should stay a legend even though its pretty cool. CP is changing too fast.. Disney in general ruined it.. And how are people getting their rainbow puffles already!? I came on when it started (March 21) and where's MY puffle?